Coming Through Loud And Clear: The 9 Best Phones For The Hard of Hearing. Nobody likes to repeat themselves when talking on the phone. 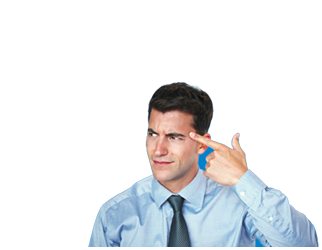 It can be embarrassing and frustrating not to be able to communicate clearly with co-workers or family. Most people experience hearing loss as they age, but do not know that there are tools available to help. If this is the case for you, a family or team member, then read on. In a rush? Jump to the top 9 amplified phones now. You don’t need all the technical detail about signal strength and sound waves, to find a phone that will work for you. We will focus on your hearing, and whether it is amplification, tone changes or visual cues that will help you communicate more efficiently. 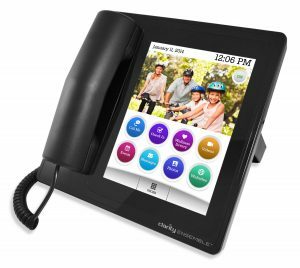 If you’re uncertain whether or not you would benefit from purchasing an amplified phone, then this guide will help you make an informed decision. So, what is there to know about amplified phones? Do I need an amplified phone? What makes a good amplified phone? Do you often need to repeat yourself on the phone? Are you tired of repeating the phrase “What? I can’t hear you.” on phone calls? Do you have to escape to the silence of the bathroom so you can have a decent call? Does this sound familiar? 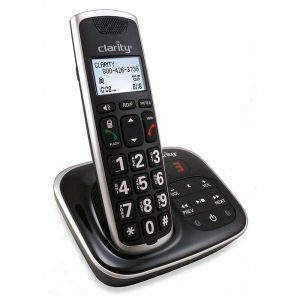 Good news: an amplified phone is the right solution for you! Perhaps you’ve noticed a loved one or coworker is in need of an amplified phone. According to UK based charity Action on Hearing Loss, it is estimated that by the year 2035 more than 15.5 million people in the UK will have partial or severe hearing loss. That’s more than 1 of every five people! However, this is not the only reason you would purchase an amplified phone. 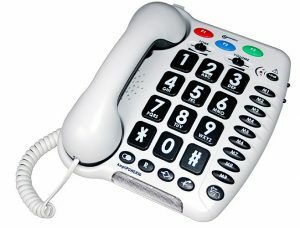 Even if you don’t have a hearing problem, you could benefit from a speciality phone if your work environment is noisy. If you work in a noisy place like a nightclub or factory, then a phone with extra volume or visual cues could make communication easier. 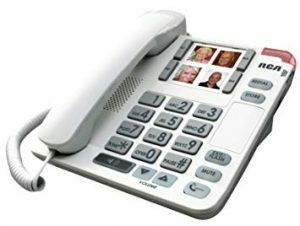 The most important feature of an amplified phone is its decibel (dB) level or volume. Some brands claim 30 dB is enough for both people with normal hearing and people with minor loss of hearing. However, other phones come with an adjustable volume of up to 60 dB to aid with more severe hearing loss. Amplification also extends to the ringer volume—so you don’t have to worry about hearing the phone ring while in another room, or away from your desk. Some amplified phones can even reach up to 100 dB. Amplification can be beneficial if you have a hard time hearing, but also if you’re not a confident speaker or even if your environment is noisy. Many phone models have a feature to intensify your voice, so the other end of the line doesn’t have to request for you to speak louder awkwardly. A flashing flight can alert you to an incoming phone call, perfect for situations where you might not hear the phone ring. This feature is especially useful on a busy factory floor or environment with loud music playing. This could be the best solution for those with hearing loss, primarily if you work in a busy office and do not want to have an amplified ringer on your phone disturbing others. The flashing light is either on the base of your phone or your handset, look out for this feature if it suits your needs. Most telephones that utilise magnets to drive sound are Hearing Aid Compatible (HAC). Inside of most hearing aids, there is a device called a telecoil which allows the hearing aid to hear magnetic representations of sound along with sound waves themselves. Being compatible means the telephone will transmit a magnetic current together with the sound wave. This will improve your ability to hear when using a hearing aid. HAC also means there will be no interference or whistling noises when you use the phone. Sound doesn’t just come in one variety; there are low middle and high-frequency sounds. dBA —decibel level with a low frequency. dBB —decibel level with a middle frequency. dBC —decibel level with a high frequency. It is common that we lose the ability to hear high frequency sounds first as we age. If this is the case for you, you might want to amplify just the high-frequency sounds of your phone conversations. By being able to adjust these tonal and pitch settings, you will be able to hear the conversation better. Many models also come with enhanced equaliser settings to get the perfect adjustment for comfort rather than increasing the overall volume. The benefit of a cordless phone is obviously that you can take calls from any part of your house. Gone are the days where we sat in a hallway to talk on the phone. Selecting a handset with good signal range means you can enjoy your conversation in the privacy of your room or even garden. 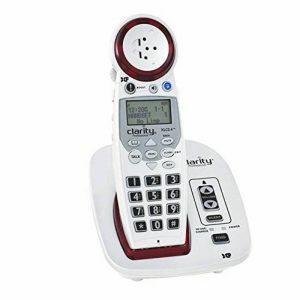 If the battery on your cordless phone dies they you be feeling pretty lonely until you remember to recharge it! You want to select a phone with a strong battery. Battery power is measured in mAhs (milliampere–hour). An AAA battery (commonly used in phones) have 1000mAh per battery. Whereas, other phones have their specific types of batteries which hold from 400 to 700 mAH. With 700 mAh you will get 420 mins to call time or 120 hours of standby time. Most phones also have a backup battery pack for their bases as well as their handsets, just in case the power is out, so you can still make calls. You may want a phone that allows you to make hands-free calls, using either a speakerphone or by plugging in headphones with a microphone. 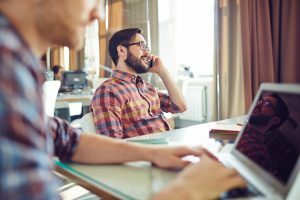 Both options make it easier to multitask while speaking on the phone – and without the pain of holding the phone to your shoulder. If you want to keep hands-free calls private by using headphones, then you need a phone with a headset jack. Not all models have this feature, so keep an eye out for it. But where will your phone go? 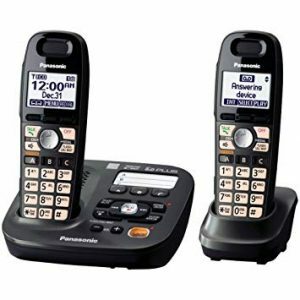 If you want to use your cordless phone hands-free, then picking a model with a belt clip could be your best bet. 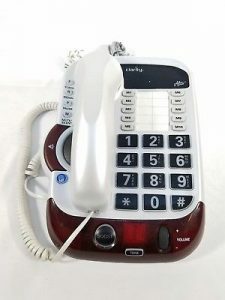 As for corded phones, phone models are made for the desk and some for wall mounting, but rarely both. So take a look at this when you are making your final decision. The market for amplified phones isn’t a big one, but it’s still oversaturated enough to be confusing. Here you will be introduced to the three types of available amplified phones. Let’s dig into some more detail for these three models so you can pick the right one for your home or business. Pros and cons from existing users are listed, keep in mind that these views are of course subjective and someone else’s negatives could be positives for your situation. Full details for these model are listed below, along with some disadvantages offered by current users. Keep in mind that user views are subjective and may not be an issue for your purposes. 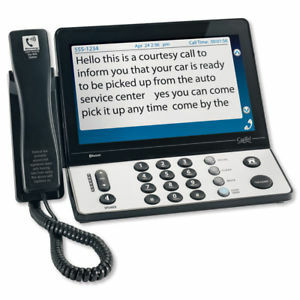 Captioned telephones are an incredible invention; they combine amplified phones and computer speech–to–text technology. 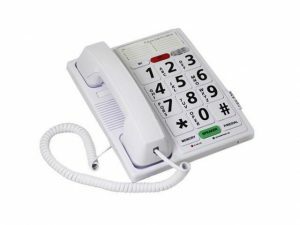 Even at 60 dB, it can be hard to hear the conversation if you suffer from hearing loss and to help solve this problem captioned telephones can give you an almost instant word for word script of your conversation. Do you need extreme amplification? Does it have a visual ringer? Can you adjust the tone settings? Do you prefer corded or cordless? Is reading the captions important? Is it compatible with hearing aids? Do you need extra battery life? Are you paying for more than you need? If you have hearing loss or work in a loud environment, then one of these phones could be a game changer for your ability to communicate.